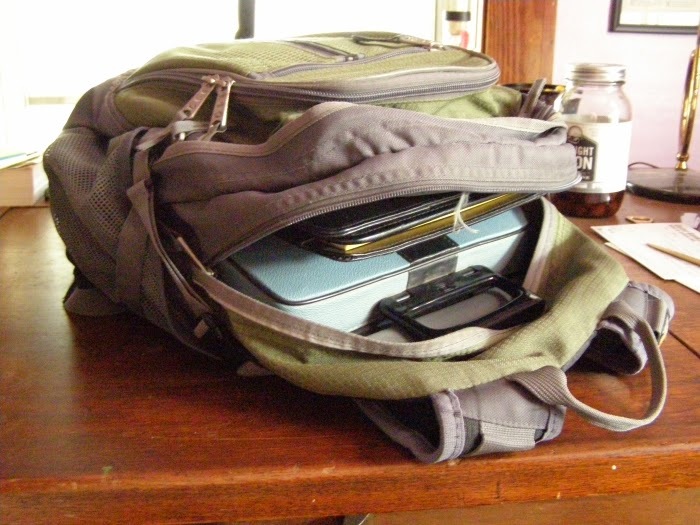 Lettera 32 with all the gear I take when I go somewhere to write. Older zipper on top, newer one on the bottom, and the type of damage which is common with the old zipper off to the side. 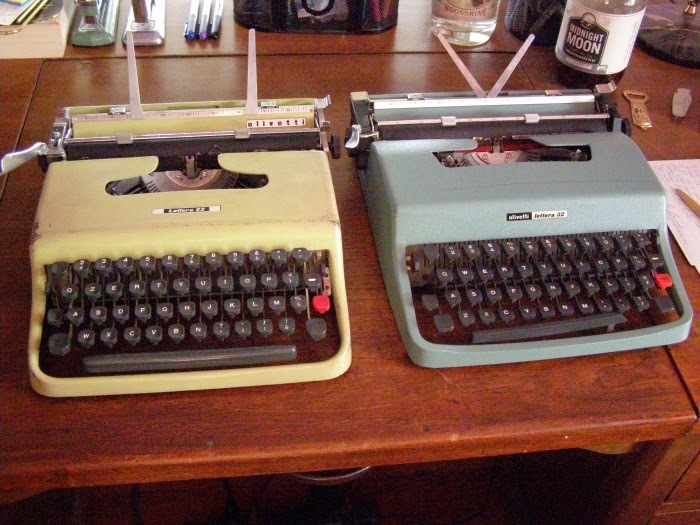 The Lettera 22 (the green one) is just barely smaller than the 32. Great review of the L32, glad to hear it's your favorite laptop machine. You know, I have had a few of these machines too, but I don't feel the same passion for them. They're good, very adequate typers, but I never feel really at home on the keyboard. That said, there's nothing bad about them. They're robust and well made machines. I have a Lettera 32, which does "seem" to be more rugged than my shinier glossier round-keyed Lettera 22. But that may be just because I'm less afraid to bash away on it than I am on my favourite. I agree that 32 is a very good portable, nice and quite light touch, well built and robust but that thin spacebar placed closely to the bottom row of the keys is what spoils this machine for me a bit. Hey, a bit out of context, and I love that you're doing comparisons, and "road tests". But I just picked up a Remington Rand "All New " portable from late 1949, on sale for $28.00. Had been looking for one since you did one of your posts about them. I like the styling! On my way home to clean it up and try it out - Maybe it'll get a short story written about it if I'm inspired by it. I'll reread your post - at a local coffeehouse I seem to remember! Thanks. Those are good machines, and it sounds like you got a good price too. Enjoy it! I bought my Lett 32 in 1982 and used it extensively throughout high school. I still have this machine and, while it doesn't get used as often these days as my other machines, it is without doubt my most sentimental favourite. Rock-solid and near perfect ( I wish it had 12 ch per inch instead of ten. Minor quibble) and portable as all get-out. Classic, classic typewriter. If I had to rationalise my collection, the Glasgow-built L32 would be amongst the top 5 keepers. It does everything very well. Nothing is compromised just because it is small. I love the action and it can certainly keep up with my two finger typing speed. I suppose that's why there are so many around and you can get them reasonably cheaply around the globe - Olivetti's Lettera was a success because it works well and has quality. 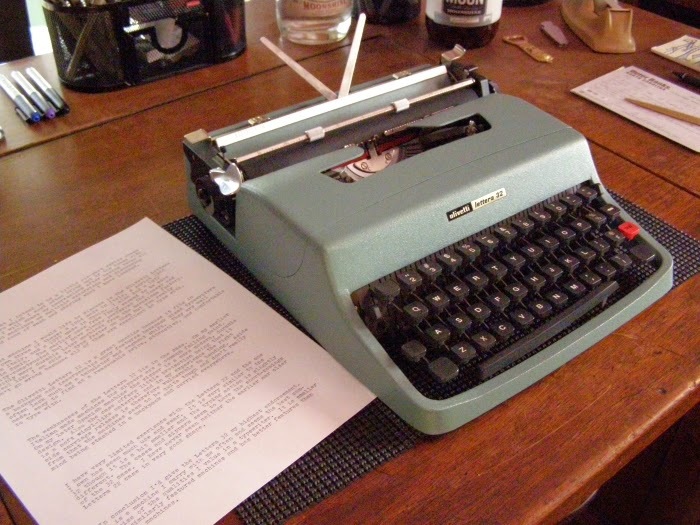 With a bit of luck, I'll soon be able to compare mine to the Lettera 22 as well. I have high hopes, of course.